More than 300 bishops including a dozen cardinals heard Pope Francis tell them of his heartfelt sorrow for the pain caused by priests involved in the sexual abuse scandals of the last decades. He addressed them Sunday morning, Sept. 27, at St. Charles Borromeo Seminary in Wynnewood. The pontiff urged his brother bishops to strengthen the bond between the church and the family, and he issued the hierarchy a rallying cry for pastoral care. Walking down a hallway lined with seminarians before entering the seminary’s St. Martin’s Chapel at 9 a.m., Pope Francis clearly enjoyed greeting and waving to the young men. He paused for cell phone photos as he walked and stopped to chat with a few students, including a relatively long conversation for a couple minutes with a Hispanic seminarian, in Spanish. The pope, like a grandfather, quipped with the young man and gave him a playful tap on the cheek before walking away into the chapel, to the applause of the assembled bishops. After an introduction by Archbishop Charles Chaput, who sat at the chapel’s altar with seminary rector Bishop Timothy Senior, Pope Francis began his address on a somber note. “From the very depths of my heart I wanted to share the stories of pain of those who were abused by priests,” he said. He was referring to an unscheduled meeting he held earlier in the morning with five survivors of sexual abuse by priests. Between 8 and 9 a.m., Pope Francis spoke with three women and two men and prayed with them, expressing great sorrow for their pain and assured them of accompanying them in their suffering. This set the tone for the remainder of his speech, which focused on the pastoral nature of bishops and the need to shepherd their flocks — particularly with regard to the family. The pope’s talk was not without joy, or a little levity. 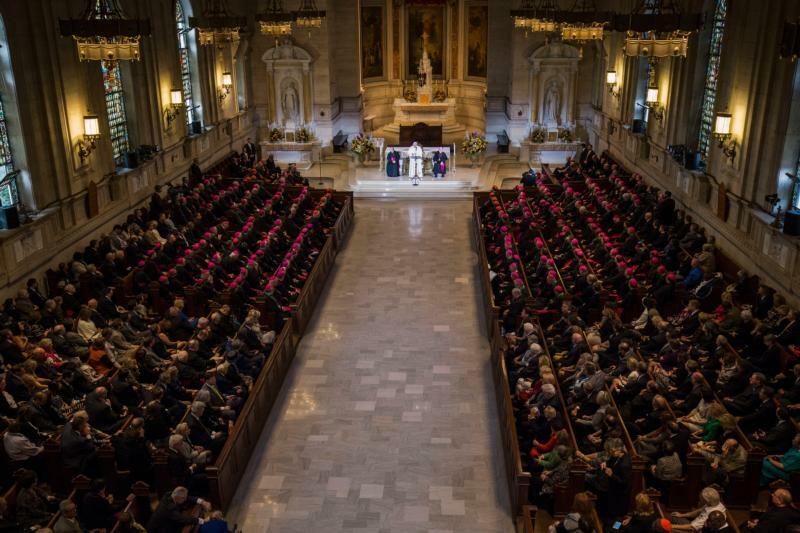 At one point early in the speech he quipped, “I’m speaking in Spanish because all of you know Spanish,” to the chuckles of the bishops. Noting that without the family “the church would not exist,” Pope Francis was emphatic that the current issues debated in society, such as marriage, should not dictate the church’s policy toward them. The back-to-basics talk resonated with Bishop Mark J. Seitz of the Diocese of El Paso. “He told us what we needed to hear. We’re so easily distracted with the heaviness of very complex issues, but he really called us back to the basics, which is something we need to hear every now and again, or we forget,” Bishop Seitz said. While the tone was pastoral, the address was largely familiar, and even emphatic of the particular calling of celibacy in the clergy. “A good pastor renounces the love of a family precisely in order to focus all his energies, and the grace of his particular vocation, on the evangelical blessing of the love of men and women who carry forward God’s plan of creation,” the pope said. Yet the theme throughout was that pastors should start such a ministry by “beginning with those who are lost, abandoned, wounded, broken, downtrodden and deprived of their dignity,” he said. Calling on his brother bishops to “plant even in the rows that deviate from the normal,” Cardinal Tagle cited the Gospel story of the Samaritan woman at the well: “She had five non-husbands and even she was able to give testimony,” he said. Pope Francis further framed his points to the bishops by comparing them, as he has in past speeches, to shepherds. “As shepherds following in the footsteps of the Good Shepherd, we are asked to seek out, to accompany, to lift up, to bind up the wounds of our time,” the pope said. He ended with a reference to the family, which was the theme for the week in Philadelphia and the reason he ended his apostolic visit to the United States in the city, as it concluding hosting the Eighth World Meeting of Families. At some 20,000 participants, it was the most successful such triennial meeting since its inception in 1994. “The family is our ally, our window to the world, the evidence of an irrevocable blessing of God destined for all the children who in every age are born into this difficult yet beautiful creation which God has asked us to serve!” Pope Francis said.